Robot butlers, flying cars, invisibility cloaks, super powers, nutrition through pills, teleportation, time travelling; we all know these future predictions from the movies and comic books. Some developments seem plausible, others improbable. They play roles in our daydreams and in fictive stories. Part of them probably won’t be around any time soon, part of them might never be invented by someone. But don’t be snapped out of your dream just yet. There are actual inventions foreseen which could easily star in a science fiction book as well as in real life. Last week, Microsoft released a video with their latest predictions in future devices and media, Productivity Future Vision. In this video, featured below, Microsoft unveils that in five to ten years, frameless touch screens of all sizes will dominate everyday life. Even holograms will be possible. This is by far not the first predictive video of a media company around. In fact, this video is the follow-up of the Microsoft in 2019 series. 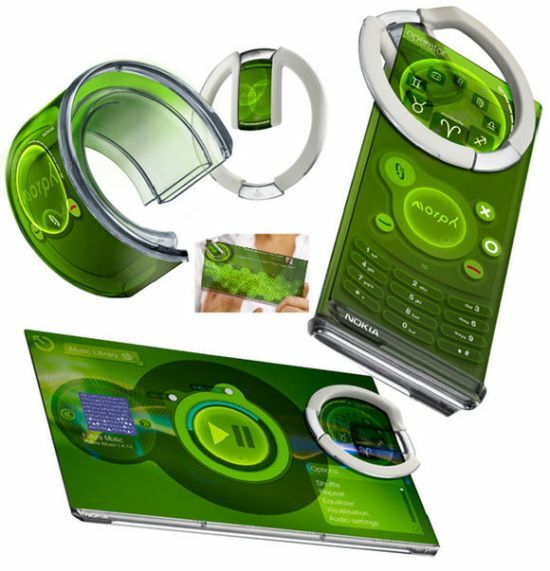 In Februari 2008, Nokia released the concept phone Morph, a nanotechnology based device which is flexible, sturdy and green. You can watch the explanatory video on Nokia Morph here.We might now see this concept phone get closer to reality with new developments by Samsung: flexible display devices. What do all these futuristic devices and, more importantly, their use mean for society if they were to become reality? How will future use look? What will these devices mean for public and private sphere? Below I present four considerations related to the consequences of the future (devices) Microsoft presents. Even though in present day private and public live seems to revolve around mobile devices, at home, on the go, at lunch, work, dinner, going out and so on, in five to ten years use rate will only increase. Everywhere people will be interacting with touch screens all the time. As can be seen in the video, devices will be as small as business cards and will have great portability. 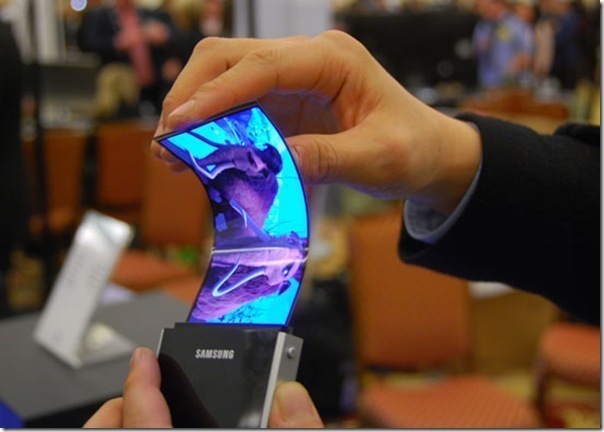 Touch screens will not only become more compact, they will also expand (while staying flat). More and more suitable surfaces will be transformed to interactive media screens. More screens means more use by people. And more use by people means more immersion into the digital realm. Wealthy people will live with these devices day by day. Some people might still want to get a break from digital devices in their holiday, as is the trend now, but this group might decrease in size slowly but surely. People will be drenched into touch screen devices as they have been drenched into advertisements before. Life will become a little easier and more predictable. There will remain many places to discover, but the way in which this happens changes. Moreover, people will be at many places at the same time. Or rather, their data doubles will be. More use at more places resulting in hyperpresence; this is what the future will look like. As described above, touch screen devices will be everywhere around us. Not only will they make us act in hyperpresence, they will also distract us constantly. The shiny, fun, cool objects all around us (augmented reality) are constantly seducing us to use them. Dealing with this has two sides which can exist parallel to each other. On one side, we might become less receivable to all this attention seizing at some point, in the same way we arguably got better at ignoring all the advertisements headed our direction. On the other side, we might get better at processing all the information torpedoed towards us every minute of every day. Our brains will adapt to execute swift and adequate processing of information. As some people see happening now, our brain functionality is shifting from remembering facts to processing and linking information to things we have seen earlier. A recognizable example is human memory of phone numbers. Not too long ago, we all memorized phone numbers by heart. Now with the coming of mobile devices and phones with LCD displays and an internal memory, we no longer have to and so we no longer do. We manage to remember some of the most important phone numbers, but by no means do we care to remember the number of a vague acquaintance. This development is also nurtured by the rise of other communicational possibilities such as Facebook and Skype. An interesting paper on this was written by Nicholas Carr, called ‘Is Google Making us Stupid?’ So yes, we are arguably getting less good at remembering facts of all kinds. Taking its place might be improved alertness, processing accuracy, linking and associating, networking, etc. One might also argue that concentration spans are decreasing as well, meaning that we must perform tasks in shorter amounts of time, asking for a short spur of high concentration and productivity. In sum, on the one hand, we want to be able to deal with information better and faster, but on the other hand we want to keep out any excess. What we see now on platforms such as Facebook, is that people are connected to a lot of people which all produce a constant information flow. In order to “survive the everyday information tsunami” we will have to filter out important stories automatically and manually, by only befriending important people and/or by increasing our internal neural processing speed. In a world dominated by augmented reality and (mobile) touch screen devices everywhere, it is hard to keep secrets. As can be seen in the video, Ayla hails a taxi just by stepping towards the road, the hotel staff knows of her travel process, bag amount etcetera, and these are just some simple, innocent looking but radical examples. We can spot developments pointing towards this anti-privacy state in our present society. Mobile devices with GPS, locative apps, surveillance cameras on the street, Wi-Fi and IP recognition, Facebook, Twitter and YouTube self exposure, etc., are all signs of a society headed towards less privacy, more openness, more surveillance and more control. Yes, it will become increasingly important to consider your actions before you act them and yes people will get more conscious of their behavior. We see this happening now, with the Facebook Spotify app for example, where it would be wise to only listen to socially acceptable music because all your Facebook “friends” will know the songs you played. Even he who has nothing to hide should be cautious. Information that seems innocent enough uncover at present day might become highly sensitive information in the future. Just like what happened with the religious archives that were brought about to make sure people would be buried in the cemetery corresponding to their beliefs, the archives which were later found by the Germans who could pick out all the Jews with great ease this way. The archives were brought about with good intentions, yet they were later consulted with horrible intentions. Because, quite contradictive to the topic of this blog, we never know what exactly the future might have in store for us, we should always be careful in what we post online. 4. More or less adventure? In the video one gets the sense that the new technology will do everything for you. You don’t have to hail a taxi, your glasses will translate Asian to English, augmented data will show you where your meeting tomorrow is, the hotel staff knows of your exact time of arrival, when you are waiting for the metro your phone will pop up things to do in the meantime, the building automation system will recommend more efficient water pumps for you and when you want to bake a difficult pie, your device will help you step by step. Now, arguably all this will leave you with more spare time to do fun things, but it also refrains you from looking around into the world yourself. In the ‘Microsoft in 2019’ video, an arrow appeared on the floor before a business man to show him the way to his meeting. Sure, you won’t have to go through the “hustle” of finding your way using normal signs and the chances of getting lost are decreased substantially. But consider for a minute what this degree of dependence on technology means for thinking for yourself. we should consider for a minute if we want electronics and their developers to take over our lives. This will be all. For now. Leave me some comments below, I’m interested to read what you think!